Please note: in the above picture on the right, for size comparison; left is 45-100 Sharps, right is Winchester 30-30. Please Note: Limit One Cartridge per Customer. 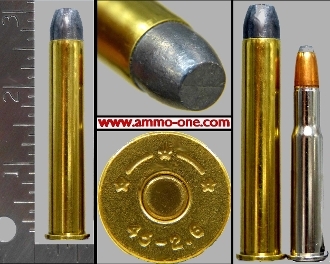 One Cartridge not a Box: .45-100 Sharps Straight, 2 & 6/10", custom loaded using then new, Starline cases with "45-2.6 *∩*∩*” Head-Stamp and loaded with 405 grain lead projectiles. The 45-100 Sharps cartridge was introduced around 1896 by the Sharps Rifle Company for the Sharps-Borchardt rifles in 4 verisions the 45- 90 Sharps Straight, the 45- 100 Sharps Straight, the 45- 110 Sharps Straight and the 45- Sharps Special. The company went out of business in 1981, and the cartridges had a short life. In the last few decades , companies have started to reproduce the rifles and cartridges, although the brass is hard to find at the time of this writing, 03/29/2019.